Recently, a new educational booklet elaborated by Public Relations and Museum Education Section was published as part of „Another kind of school at the museum” museum pedagogy program. 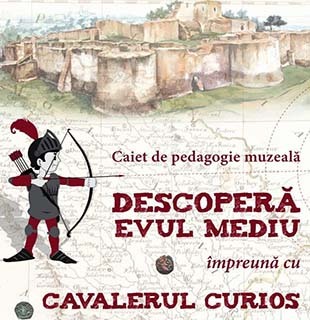 The booklet „Discover Medieval Age with the Curious Knight” is an instrument of museum pedagogy available to children from the gymnasium cycle for thematic interactive visits of Medieval History compartment of the permanent exhibition „History and civilization” of the National Museum of History of Moldova. The booklet promotes education through heritage as alternative form of learning history. It brings to the attention of children and teachers the collections of medieval history of the museum into a fun and educative way, contributing to strengthening knowledge and to creating of a respectful attitude towards national cultural values. The booklet is richly illustrated and offers a variety of exercises aimed at deepening historic knowledge of the Medieval Age through heritage objects involving children’s spirit of observation, attention and memory in a fun and relaxed way. We invite you to visit the museum, to embark on a fascinating time travel and discover the mysteries and truths of medieval history accompanied by the Curious Knight, a fearless character of European Medieval Age.